Holidays are some of the most stressful times of year for distributors, affecting every link in the supply chain. Suppliers take certain times of year off; for example, suppliers in China are closed for the Chinese New Year in the early part of the year for at least two weeks – and often longer. And retailers and other customers deal with a change in demand and closures during the holidays; an example of this is increased demand for gift items for retailers around Christmas. Navigating around holiday closures and demand changes on both ends of your supply chain ends up being a time consuming and arduous task. You need to make sure that you’re ordering enough from your suppliers to cover your increased demand while factoring in lead time so that you have the items you need on hand. But in addition to this, you need to make sure that you are getting orders out to your customers in time for them to cover their own demand. This kind of demand at both ends requires intense preparation months in advance, and without the right tools you can still end up missing needed items due to poor planning. The first step for a successful holiday season is accurately forecasting demand and adjusting reorder amounts. The second is analysing lead time for the different products you need to order and adjusting reorder points. Fortunately, there are different capabilities in inventory management software to automatically help navigate tricky closure dates around the holidays. 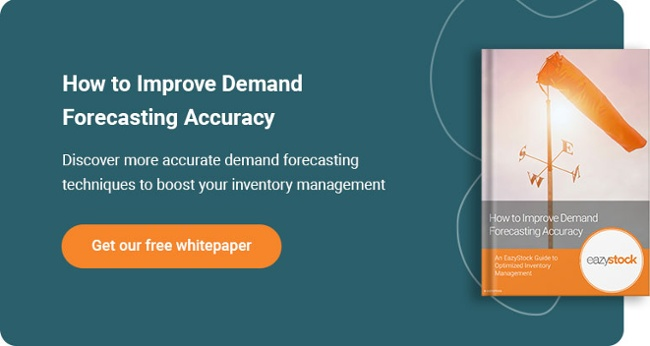 When it comes to accurate forecasting for changed holiday demand, EazyStock’s automated forecasting capabilities analyse past sales data item by item to give an accurate forecast on every item in your inventory. With built in seasonality features, EazyStock is also able to adjust items that will have a sharp spike in demand during holiday periods. EazyStock then automatically adjusts your reorder levels and sets a reorder point based on the lead time of items so that you will have what you need in stock when you need it. Of course, forecasting only gets you so far in terms of preparation for the holidays. How do you make sure that your supplier will be available to fill your order before they take time off for the holidays? How do you make sure that you will have time to deliver to your customers so they can fulfill their orders? Taking closure dates into account for your suppliers, your customers, and yourself will save you headaches when you’re coordinating deliveries. Fortunately, there’s a way to do this in EazyStock with the software’s schedule capabilities. EazyStock’s schedule capabilities allow you to build schedules for different parameters: supplier, warehouse, or item, and schedules can be for ordering or for receiving. For example, if you are creating a schedule for when to order from a certain supplier, you can include or exclude dates on which you can order; you can exclude the dates when your supplier will be off for the holidays so that the software knows not to schedule any orders for these days. Building this schedule and assigning it to the items that you order from that specific supplier will allow the system to automatically adjust when you need to order items based on the holidays. EazyStock’s schedule capabilities will automatically adjust the re-order point to cover the time when your supplier is out and triggering the order early enough for your supplier to be able to fulfill it. Likewise, you can create a schedule for when you are available to receive orders. If your company takes time off during the holidays, you can make sure to exclude those dates from your schedule. This way, when EazyStock is setting the date for reordering, it will set it early enough in advance so that you receive orders before you leave so that you’ll have the stock on hand. EazyStock’s schedule capabilities can also be used for ordinary demand periods to ensure deliveries won’t arrive on weekends and so that each supplier or item will arrive on a consistent day of the week. To see how holidays affect your demand and therefore your inventory levels, take a look at the graph below. The blue line represents your on-hand (current) stock level, the red dotted line represents your buffer stock level and the solid red line represents the order level (that is, once your stock reaches that amount, you need to reorder). The order level is high because it covers the forecast over the lead time – the time between when you place your order to when you receive your order in hand. On this graph, the blue block represents a time gap between orders (in this case, a period during which you will not place orders, but your suppliers are still active). This gap increases the required coverage period of the on-hand stock and is reflected in an increase to the order level and the buffer stock. This triggers an additional order to account for the extra demand you will need to satisfy over the increased coverage period. The blue dotted line illustrates what happens if you fail to place the additional order prior to the extended coverage period; you consume all of your buffer stock and will have a gap where you won’t be able to fulfill orders to your customers. Holidays can make or break your customer satisfaction levels. By having what you need for your customers when they need it, you ensure that they’ll consider you as reliable and will stay loyal even after the holiday rush period. But in order to keep your service levels high, you need to make sure you have everything you need. Optimising your replenishment processes with updated schedule capabilities and keeping supplier schedules in mind can help you navigate the chaotic holiday demand changes and will take the headache out of the holidays for you. Make sure you have all the tools you need to make this holiday period successful!